Planning a rendezvous can be a heck of a lot of fun, and it can be an extremely rewarding experience for all who attend. It can also be a headache if it’s not planned properly. 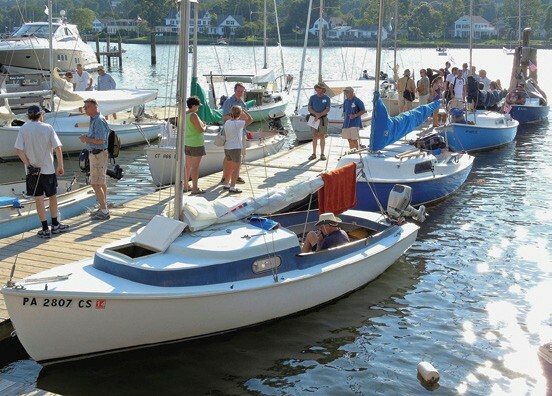 Having organized a number of small boat rendezvous here in Connecticut for members of the Mariner Class Association, I have learned a number of valuable lessons that are may serve to help others plan get-togethers on the water. 1. Make the destinations easy. Think back to when you were a first-time sailor, or the first time you took your family out on your boat. Chances are you didn’t sail very far, and you (and your family) were probably pretty glad for that. Keep the destination(s) fairly close, and select the locations for their scenery and availability. Make sure there is stuff to do once you’re there that will keep people entertained and happy. 2. Plan as if everything will be against you. While it is possible to factor in currents ahead of time, it’s obviously impossible to forecast the weather months ahead. Therefore, you should consider what would happen if the wind was right on your nose both coming and going, and also if it rains or winds are high the whole time. On the flip side, you should plan for no wind, both coming and going – think about how long your attendees really want to listen to a whining outboard if that should happen. Personally, I have found that a destination around 15 miles away seems to be ideal. 3. Make the return trip easier than getting there. By the end of a rendezvous weekend, most people are a little tired and some may be facing potentially lengthy drives home. If you have multiple destinations during the event, make sure the final leg home is a short one so people have plenty of time to pack up and tackle the highway (or waterway) without being exhausted. If currents are a factor, don’t be afraid to plan for the current to be against you on the way to your destination, for that means it will be with you for the return leg back to the launch ramp. On Long Island Sound, the current can be quite swift, but it also can be used to your benefit. 4. Communicate as much and as often as you can. It’s important to provide as much information as you can before and after people register for the event. The more people know, the more they’ll get excited about it and plan accordingly. Be up front with costs, detail the launch site and destination, and create an itinerary early so people know what to expect. Online forums are an excellent way to maintain communication because everybody can ask questions and receive your replies. worked fine then. I let it go, which was a mistake on my part. A lot can happen to an engine in transit, especially if it’s stored improperly and fuel or oil leaks into places it shouldn’t. By the time he realized his engine wouldn’t start, the sailor who had brought a spare was long gone, on his way to the event destination. It would’ve been a lot easier to swap outboards at the launch ramp and have the problem solved then and there instead of having someone (it ended up being me) tow him in and out of two harbors in rough conditions. 7. Delegate responsibility. As event organizer, I used to take it upon myself to keep tabs on all the other sailors on the water. Once sailors choose their own path and disperse, it becomes very difficult and to know where each boat is, especially if you’re at the back of the pack. I used to feel a lot of stress worrying about each boat, especially when the weather was bad. For the 2014 Mariner Rendezvous, several experienced skippers were chosen as “Co-captains,” each looking after three or four other boats during the course of the weekend and occasionally reporting back to me. This new chain-of-command structure worked extremely well by streamlining communication and creating a much lower-stress environment. 8. Provide everyone with everybody’s contact information. This may seem like a no-brainer, but it’s important to remember, especially if someone gets in trouble – on or off the water – and needs to contact someone. A couple times, my cell phone died, and other people were trying to get ahold of me. If they had had a list with everyone’s contact information, they could have phoned someone else to relay a message. 9. Have a Waiver of Liability. Obviously, sailors need to take responsibility for their own actions on the water. In the event of some kind of incident, especially with unpredictable weather and varying degrees of skipper experience, it’s important for certain entities to be held harmless. If a boat capsizes with serious consequences for skipper and crew, it could open up a whole can of worms for the class association (if it’s a class event) and the event organizer. A Waiver of Liability provides a level of important protection, and many owner rendezvous require such a waiver. There are many online examples you can use to craft one for your own needs. 10. Have a good time yourself. It’s easy to get caught up in the planning and execution of a rendezvous and have the event pass you by as you work to keep things coordinated. Don’t be afraid to step back every now and then and realize that rendezvous are supposed to be fun for everybody, including you. If you find yourself getting overwhelmed, ask for – and, perhaps more importantly, accept – help. Don’t try to shoulder burdens alone when there are plenty of people around who might be willing and able to lend a hand. Chances are, you’ll get all the help you need for a highly successful rendezvous that people will want to repeat again and again. Nate Bayreuther has owned his 1970 O’Day Mariner Orion since 2007 and is a member of the Executive Board of the Mariner Class Association. 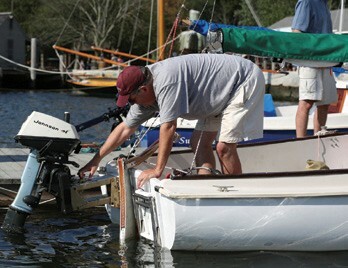 A professional full-time organist, he grew up next door to his family’s marina, Bayreuther Boat Yard, in Niantic, CT. He lives with his wife and son in Wallingford and can frequently be found sailing the waters of Long Island Sound. Visit mariner1922.com for more about his Mariner and usmariner.org for the Mariner Class Association.